With daylight savings time coming to a close this Sunday, November 3rd, you’ll get one extra hour of precious time for sleep waking up with a hot cup of joe. Make your mornings and breakfasts those of champions with luxuriously delicious homemade “donuts”. Brunch Beignets with Mocha Crème Anglaise are sure to impress friends and family (admit it, even the name is impressive!). These fun party poppers provide the perfect mix of cinnamon and sugar, not to mention the devilishly good dipping sauce – did anyone say cocoa, espresso and Kahlùa?! You’ll never want to opt for store bought coffee and donuts again! Heat at least 2 inches of oil to 350° F in a large, deep pot. Make Crème Anglaise: In a medium saucepan over medium heat, whisk milk, cream, espresso and cocoa powder until combined. Bring mixture to a slight simmer. In a medium bowl, combine the egg yolks and sugar. Beat the egg yolk mixture using an electric mixer until pale, light yellow and thick, about 3-5 minutes. Slowly, add half of the mocha milk mixture to the yolk mixture and whisk until blended. Add the second half of the milk mixture. Transfer the mixture back to a saucepan and cook over low heat until it reaches 160ºF or when mixture coats the back of a spoon. Quickly remove from heat (It will turn to scrambled eggs if it goes over this temperature) and strain immediately into a bowl placed on an ice bath. Whisk in the Kahlùa and stir until the mixture reaches room temperature. Prepare Beignet Mixture: In a small bowl, whisk together the milk, eggs, and melted butter. In a separate medium bowl, whisk the flour, baking powder, salt, sugar and cinnamon. Add the milk mixture and stir just until smooth. Be careful not to over mix or dough will be tough. Make Cinnamon Sugar: In a medium bowl, combine the sugar and cinnamon. Set aside. 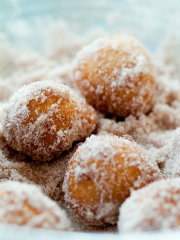 Fry Beignets: When the oil is heated, using a 1 inch ice cream scoop, drop dough into the hot oil. Fry 5 or 6 beignets at a time, making sure there is plenty of room for them to expand. Fry the beignets for 1-2 minutes on each side until deep golden and cooked through. Use a slotted spoon or spider to remove them from the oil and drain on a cooling rack over a sheet pan. When the oil has drained off the beignets and they are still hot, toss them into the bowl of cinnamon sugar and stir until they are well coated. Remove them to a platter and continue this process until all the beignets have been fried. Make sure to maintain the oil temperature at 350° F and to skim off any bits of fried burnt batter from the pot. 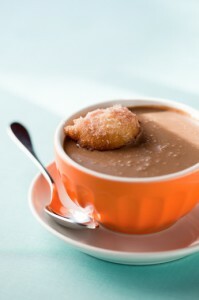 Serve: Place beignets on a serving platter and place the crème anglaise in a small bowl on the side.